Let’s talk about ducks. Duck cakes, that is! Fuzz is having her birthday party at a bath store (Bath Junkie) and the clever girl decided that her cake should be a rubber duckie. Naturally, she wanted to help make it, so we spent some time last week looking for rubber duckie cake ideas. Our “safe” idea was to just make blue frosted cupcakes and stick rubber ducks on top, but Fuzz wanted to take it a step further and build a duck. With a little help from a video, we made a practice duck cake. 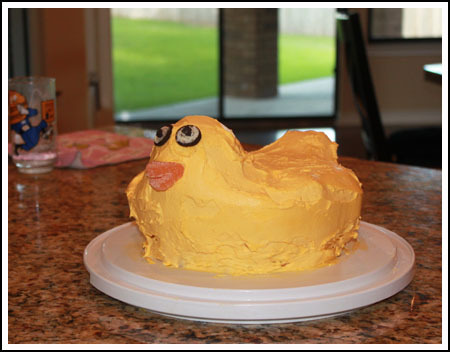 Here’s the video of how to make a rubber duckie cake. For the cake, we used the Cake Mix Doctor’s “Basic Butter Cake” (Duncan Hines white cake, 1 cup whole milk, 3 eggs, 1/2 cup butter, 2 teaspoons vanilla) and for the icing we used the directions on the back of a box of C&H Sugar. 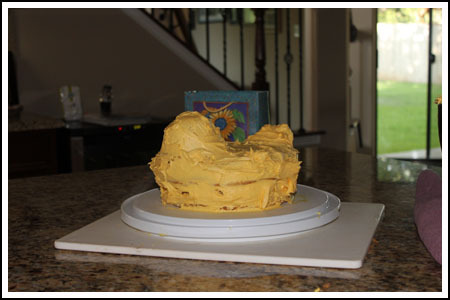 We had to make 2 full batches of icing to make enough yellow frosting, but one box of cake mix (doctored as mentioned) was enough for the body. Our cake took two days to make, but only because it required freezing. After building the cake, you frost it with a crumb layer then freeze that whole crumb layer before doing the finishing touches. Here’s the crumb layer. And here’s the finished duck! Fuzz was so proud of her practice cake she invited a bunch of girls over to come eat it. Nobody liked my idea of putting red jam between the layers, but they all liked the cake. Also, the Cake Mix Doctor’s recipe makes a great base for building cakes. I don’t make a lot of roll cakes, but I’m sure my family would be happy if I did. We love those types of cakes. The ones I can remember making are a pumpkin roll and a peppermint ice cream roll cake. Here’s a link to the peppermint cake. It had 5 eggs and called for cake flour. Hi Anna…Wow..it is really cute, i find the the red jam fun jijij .. Happy Birthday to your daughter.!! So cute! Have a Ducky birthday, Fuzz! wow great job!!! That cake will be the hit of the party! What a neat idea!! With a lot of time you could build an entire barnyard of cakes. That is such a cute cake! What a great idea, Fuzz! I love the idea of the red jam inside :). Too cute… looks yummy! What a fun idea. You are such a cool Mom! awww that is cute. good job Fuzz! The duck cake looks great. Good job, Fuzz! Happy upcoming birthday. Hope you’ve had a blast in Chicago! The duck is adorable! Red jam would have been funny! I love the Cake Mix Doctor’s cookbooks. It is nice to have a good and easy recipe for a cake. Wow, that is adorable! I have the cake mix doctor’s chocolate cake recipe cookbook and really like it. I bought it before I really became an avid baker, but I must admit, I still make recipes from it sometimes.